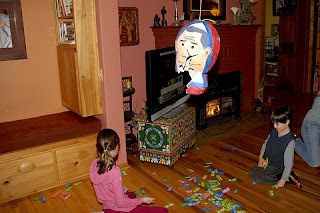 Back in March 2003, I created my first pinata. This was during the build up to the Iraq invasion, when talk of "weapons of mass destruction" was everywhere. I made it as a gift for Kelley's mother and step-father, Judy and Jack. Is that a nativity scene in the background? It's mid-January! While I never thought W would get reelected, I certainly didn't think the pinata would outlast his presidency. But it did, by a matter of hours. Judy and Jack took the pinata to an Inauguration party where it would serve as the evening's finale. I insult you with my sandal! He put up a good fight, but eventually the pinata was busted. It turned out that the pinata was authentic in a number of respects. It was a bit too thick, making it oblivious to numerous attacks. Now that he is no longer in office, is it still required that children fall to their knees in the presence of W's likeness? The pinata, just like W, was filled with great joy for oppressed people of the world. In this case, the joy took the form Airheads, rather than democracy. The oppressed were the candy-deprived children of coastal Oregon. After the pinata was broken and everyone enjoyed their candy, the work of cleaning up the mess that was left behind began in earnest. Dude....they soooooo need an Xbox over there if that's what they do for entertainment. Better yet Rock Band 2!! !